A hand fracture occurs when one of the small bones of the hand is broken. There are several small bones that together make up the supporting framework of the hand. These are the small finger bones, the phalanges, and the long bones, the metacarpals. How Does a Hand Fracture Occur? Most hand fractures occur as a result of direct trauma to the hand. Commonly an object either falls on the hand or the hand strikes an object. But you can also break a hand bone with a twisting injury or in a fall. A finger that crosses over the one next to it when you try to make a fist. What Tests are Needed to Diagnose a Hand Fracture? When you suspect your hand is broken, your doctor will examine it evaluate for deformity, mobility, and strength. Then she will get x-ray studies to determine if a bone is broken. If a fracture is seen in one of the bones of the hand a decision will be made to determine appropriate treatment for the injury. There are times when a fracture may not be apparent on an x-ray but may be suspected based on your symptoms or the way the injury occurred. In these cases, other tests including CT scans and MRIs can be helpful to show more subtle injury. Another way to evaluate is to treat as a fracture has occurred, and then re-x-ray the hand in one to two weeks. Typically, by that time, some healing has occurred, and the fracture that was not apparent should become more visible. What Treatments are Used for Hand Fractures? 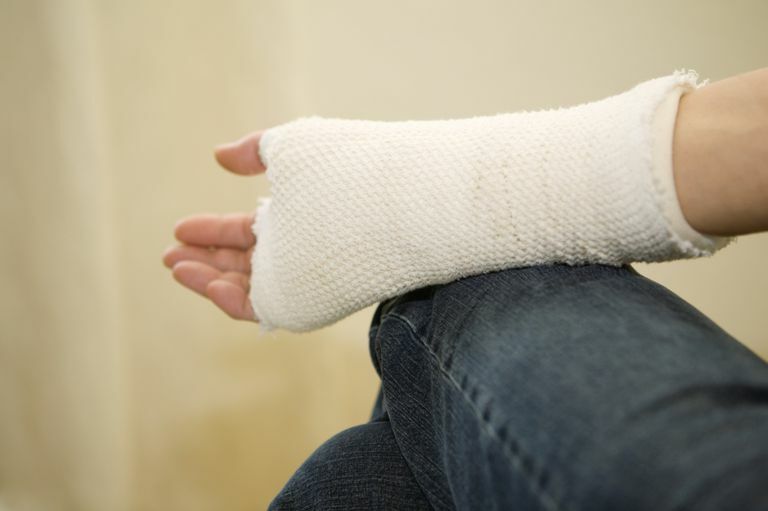 Cast and Splints: If the fracture is not displaced (meaning it is in proper position) a cast or splint will likely be sufficient for treatment of the fracture. Furthermore, there are some types of hand fractures that do not necessarily need to be in a perfect position in order to heal properly. These fractures may also be casted or splinted and allowed to heal. Pins: Small metal pins may be inserted through this skin in order to hold the bones in a better position. This procedure is usually done with the patient under general anesthesia, but may also be done with a local anesthesia block. The metal pins remain in place for several weeks while the fracture heals, and then the pins can usually be removed in the office. Metal Plates & Screws: In some unusual types of hand fractures, further treatment may be necessary. In these cases, metal screws with either a plate or an external fixator can be used to help maintain proper alignment of the bones. You may have follow-up appointments including x-rays to see if the hand is healing correctly. Your doctor will also want to see whether there is any tightness in the joints during healing. What Problems Can Happen with a Hand Fracture? Most hand fractures will heal uneventfully. The two most common problems patients who sustain a hand fracture will face are stiffness of the fingers and a noticeable bump. The bump is usually a result of extra bone the body forms as part of the healing process. While the bump does diminish in size over time it may never completely go away. Finger stiffness is prevented by beginning motion as soon as possible. It is sometimes necessary to work with a specialized hand therapist in order to help regain finger motion. Leggit JC, and Meko CJ. "Acute Finger Injuries: Part II. Fractures, Dislocations, and Thumb Injuries" Am Fam Physician. 2006 Mar 1;73(5):827-834.